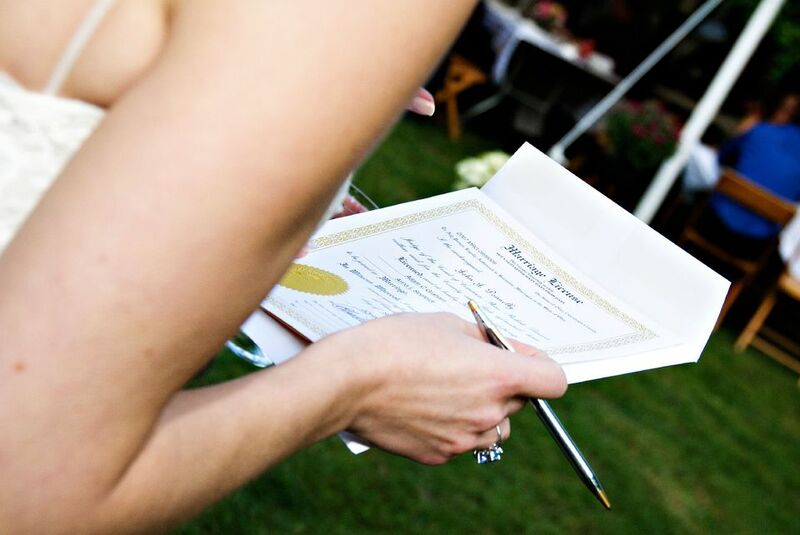 Before marriage, it's common for a couple to discuss changing a last name, and it is typically the bride who makes the name change by tracking down, organizing, and submitting the information and documents needed to make the new name legally recognized. Whether you see a name change as a tradition that recalls patriarchal days when a wife became her husband's property, a convenience for when children come, a loving gesture, an easy way to lose an unwanted or unappealing family name, or an outmoded convention will have a bearing on what you and your spouse decide to do. Some women simply take their husband's last name and relinquish the one they were born with. Others who legally change their name will convert their maiden name to their middle name and take their husband's surname. Some will use the two names with a hyphen or a space in between them. In rare instances, the groom takes the bride's last name. Then there are couples who create an entirely new last name. Bottom line: As long as the legal name change doesn't involve an attempt to defraud, you can pretty much choose to call yourselves whatever you want. When Is the Best Time for a Name Change? The best time to change your name is after the honeymoon. Here's why: You'll need a copy of your marriage license as proof for a legal name change—and most couples don't obtain this document until shortly before the wedding. In the majority of cases, that won't allow time enough to change a name on a passport and other essential travel identification. Plus, a name change on a plane ticket could incur charges. Without a consistent name on all these documents, the bearer could be inconveniently detained. To legally change your name, you must notify the appropriate government agencies. In some states a Petition for Change of Name must be filed with the county or state Supreme Court, a birth certificate may have to be presented along with the marriage certificate, and a fee paid. If the court is satisfied with the petition, it will issue an order that authorizes the petitioner to assume the new name. If it is not approved, you may have to supply additional information. If you have questions, consult an attorney. When making a list of the items you need to change, start with your Social Security card and driver's license. Once those are changed, they will be useful as identification for changing your name on other important documents. You will find that almost every record can be changed by mail, and some are as simple as a phone call. Before you start, commit to keeping a complete record of who you've contacted along with phone, address, and email information to avoid duplication or confusion later on. Also, have plenty of extra copies of your marriage license ready to mail. To be on the safe side, send all name change notices through the mail registered, return receipt requested. Several Web sites offer Federal and state-specific, official name-change packages that you can buy online. These kits bundle blank copies of free documents you need to file with the court to petition for a name change. You pay in advance, then download the information and forms in PDF format or receive the kit by mail. You pay for the convenience of getting necessary legal documents immediately rather than having to spend time gathering them yourself. Some kits also contain personal-record change forms, instructions, and a checklist to help you change your last name. Social Security Administration. It takes about 10 days for IRS records to be updated after the Social Security Administration effects your name change. Department of Motor Vehicles. This is likely to require an in-person appearance at your local Department of Motor Vehicles to submit forms, which are provided on the premises. Bring two kinds of identification, such as a certified copy of your marriage license and/or birth certificate, your current driver's license, or a U.S. passport. Don't expect to be able to change the name or address on the title of your car, however: A new title is only issued upon transfer of ownership. U.S. Passport Agency. You'll need a copy of your marriage license to change your passport information. Health, life, auto, and home insurance policies. Discount, courtesy, and frequent-flyer cards. Will (you may want to change the beneficiary to your spouse at the same time). Do I Need Permission to Travel With Grandchildren?